Apache Thornless Blackberry | Gurney's Seed & Nursery Co.
Jumbo-size fruits with jumbo-size flavor! Extra-fertile flowers, so you get more berries that are perfectly formed. Canes stand erect and are thornless. Ripens mid to late June. Zones 5-9. U.S. Patent No. 11865. FoliageCompound, mid green, pubescent foliage. BloomsEarly Summer for several weeks. FruitLarge glossy black fruit in great abundance. Soil RequirementsTolerant of a wide range of soils, will do best in well-drained, humus enriched, slightly acidic soil. Growth RateFast growth rate once established, which takes approximately 3 - 5 weeks. 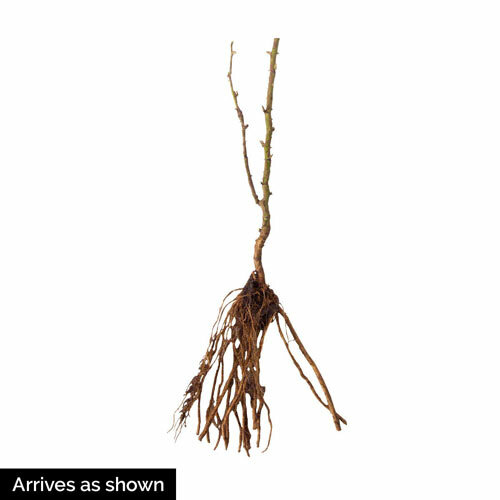 PruningTrim canes to 42 inches, remove unwanted ones in early Spring. CommentsA new variety introduced in 1999. 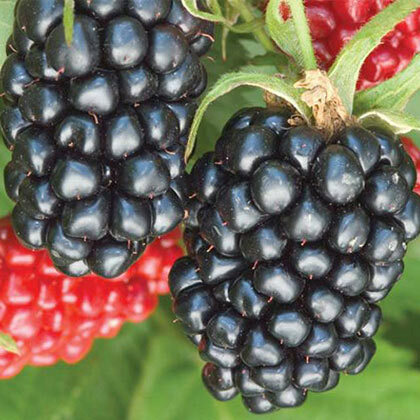 It produces higher yielding and larger fruit than other Arkansas thornless, erect varieties. It is also a more vigorous and healthy variety than others currently available, so has much to recommend it. All Arkansas upright berries should be tipped at 42 inches to encourage to fruit lateral and avoid the need for support. DepthSame depth as they were in the nursery. Plant so the roots are below soil level.